White balloons emblazoned with purple logos are filled with helium… black and gold décor items are placed in bags… matching t-shirts donned…yellow armbands tied… committee placement charts and diagrams examined… going over the game-plan one last time…and its TIME… for ILMFEST 2008! A panel of awesome instructors…a series of exciting topics… and hundreds of enthusiastic students all under one roof at Cooper Union Hall, NYC for THE event of the year, hosted by Qabeelat Tayybah. Only a year old, our Qabeelah has the honor of spending the duration of this conference working closely with the shuyookh, while at the same time interacting with students from all over the U.S. From the emotional and inspirational tribute to Imam Siraaj Wahaj, to witnessing the love and camaraderie between the shuyookh, to joining the huge line at the gyro cart outside, to being the inspiration behind the paintings on the walls, it ends up being one of the most memorable weekends in Tayybah’s history. 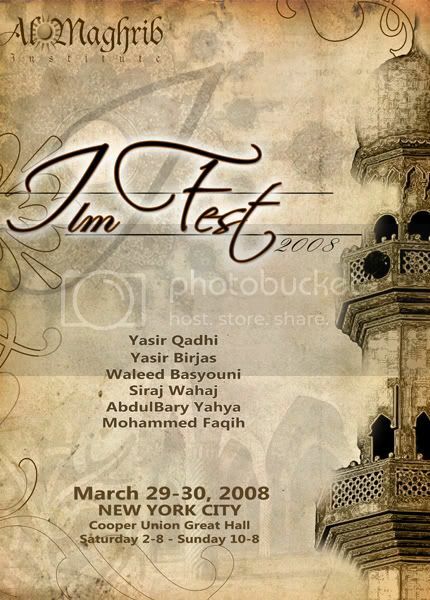 Being blessed with the opportunity to organize such a great event, we are left with unforgettable memories and a unique bond between us which makes ILMFest 08′ an experience we cherish and reminisce about to this day.